What is Micro Niche blog? 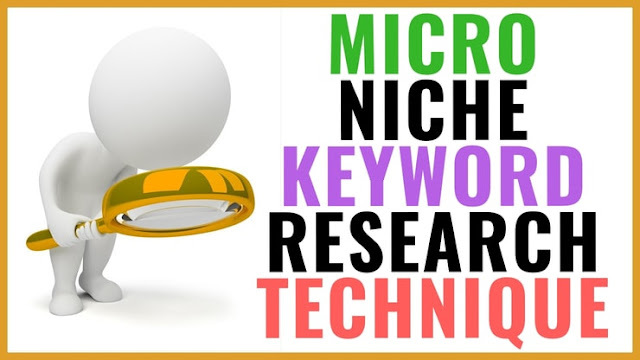 Micro Niche Blog keyword research technique for blogger: You will find many earning opportunities on the Internet, and blogging is the most accurate way for them. But many misconceptions about making money from blogging are rife that day and night have to work very hard. Yes, even if you want to make your name and brand. But when you think of earning money for a long time in a little hard work, there are many shortcuts to fulfill your desire. One of the shortcuts is that you create micro-blogs (i.e. a blog written on a particular topic). This article will tell you how to create a micro-targeting blog, which will make you easier than $ 150. You can call it a Blue Print of Micro Niche Blog. There is a saying in English that 'Jack of all trades, master of none', which means that "anyone who knows all the arts but is not an expert in anybody". Many of us often start doing this work in Blogging too. He always puts any Health Post in his blog and his next post is based on Blogging. The next day they go to the third topic. They think that writing on many subjects or Niche will bring more traffic to their blog while not so much. Doing so will not add any Passionate Reader from your blog. You tell yourself if you have any advice about Mutual Funds, then whom do you go to? Having an Engineer as well as having information about Mutual Funds, or any Expert Mutual Funds Advisor? Obviously, everyone will go to the Mutual Fund Advisor. In the same way, Readers also visit the website only on Expert and a Micro Niche related blog. Search Engines also provide a high ranking to Micro Niche Blogs. Let me tell you that the blogs written on a particular topic get more rank in the search engine. When you publish blogs with original and authoritative content on a particular topic, it gets a good rank from its own great blogs. At the same time, you will also create an evergreen blog. After making a blog with full hard work, you should think about income. You will now find information on successfully creating Micro Niche Blog. 1. Micro Niche Blog keyword research-Choose your micro niche and domain You should write the blog on the topic that you hold good. But at the same time, you have to keep in mind that this topic should be very popular with people and people, that is, people also search the Internet about it. To earn from your blog you should get good traffic from American and European blogs, this gives you more CPC. You can use SEMRUSH tool to select the topic. 2. Write a Content by Researching Keywords for Micro Niche Blog keyword research-First of all, search the topic which people want to know for a long time. For these types of topics, you can select keywords that you can get traffic or CPC more. Instead of choosing the keyword that gives you the most CPC, you should write content that can also drive traffic. So you should know that how you can use the topic you have chosen and what are its advantages? You will be able to get the right information only after doing a good keyword research. You can use a tool like SEMRUSH for this purpose. For this, you have to list the best blogs on your topic. Select blogs with more traffic. Using SEMRUSH, you can search for keywords that earn more revenue from traffic to that site. You must write at least 25 posts on this. You will have to pay a special attention to the fact that you write a post every day. Slowly, there will be high-quality posts on your site. On such topics, you are able to get traffic for 4-5 years. 4. Some things to keep in mind-Micro Niche Blog keyword research- Make Blog Perfect for SEO - Create quality posts with good keywords - Make YouTube videos for some posts and link them to your blog - Submit Sitemap to Google and Bing - Design a charming logo It should be tried that at least the hard work needs to be done to create a blog and it will be able to earn money. You should work hard to get search engine traffic in less effort so that earnings can start. 5. Creating a Social Media Profile Creating a social media profile will benefit you. For that, you have to update your content regularly on it. Share your content by creating a profile on Facebook and Google+. This will give you hundred percent organic traffic, which will improve the search rank of your blog. 6. Marketing Adsense and Affiliate After this, you can place AdSense ads and you can start affiliate marketing after some time. It will start to earn you By spending a little cost you will be able to make thousands of dollars a year. This kind of blogs you can create will benefit you and earnings will increase. Creating a Micro Niche Blog is not as daunting as it is understood. The only difference is in creating a Micro Niche Blog and creating a Common Blog is that you can make the Common Blog without any special research, but for Micro Niche Blogs, you have to do Proper Research and Planning. Along with some of the scams, your skills, interests, etc. can easily be made a Micro Niche Blog. 1. Identify your Passion for Micro Niche Blog keyword research: If you do not like Bajaj Bikes, then creating a blog about their Qualities will prove to be a bad idea for you. If you like them a little too much but do not have your keen interest in them then do not make the mistake of making them their own niche. Meaning of the thing is that whatever you like and which you like very much to know and talk about, just make the topic related to those things your Niche. 2. Micro Niche Blog-Identify Short Term and Long Term Niche: If your objective is to earn money by making a blog for a few days then you can choose Short Term Niche, but if you take Blogging as a Long Term Income Source, then you should choose Long Term Niche, which is going to look at everyone in my eyes Should do For example, if you choose a movie or a TV series, then your blog will end with the loss of the TV series or the popularity of the movie. Such blogs are called Short Term Blogs. While the future of living in the future continues to be its Niche, it is unlikely that it will end. 3. Set Up Your Micro Niche Blog keyword research: To start earning money from your Niche Blog, you must first create it. There are so many platforms like WordPress. You can buy hosting from Best Hosting Services like Bluehost or Hostgator and keep your blog in front of the world. You should now decide the layout of your blog. When visitors come to your blog, they find it nice and easy. There are many theme stores like Themeforest, Studiopress, and Thesis, from which you can buy your favorite theme and use it on your blog. You can also customize these themes according to your liking. Another essential thing is plugins. Plugins make it easy for you to manage your blog. For example, you want to add an Email Subscription Form to your blog so that visitors can subscribe to your blog. You do not have to worry about this, you just have to go to the WordPress Plugin Store and install a plugin and your work will be done. There are some Must-have Plugins for W3 Total Cache, Smush.it, Jetpack, Yoast SEO WordPress Plugin, Better WP Security etc. WordPress Blog. 4. Start typing your Micro Niche Blog keyword research: You should start writing when your blog is set fully. You should not be hasty enough to increase traffic to your blog. Because those visitors who come here will not be coming back after considering your blog as new and incomplete. Therefore, it is necessary to have at least 10-12 good posts on your blog only then try it for SEO and share it with people on Social Media Platforms. 6. Monetize Your Micro Niche Blog: You have made a blog by choosing your Niche. Now you need to monetize your micro niche blog to start earning money. Monetizing means making money through showing Ads on your Blogs or via Affiliate Marketing, Paid Reviews, etc. The easiest way to monetize is Google Adsense. You have to sign up in it, then Google Analyze your Blog. After being fully satisfied, he approves your blog. Google Adsense's Approval Policy is a bit scary, so if you want your blog to get approval quickly, sign in to Google Adsense only after having at least 1000 visits per day on your blog. Your blog should have at least 20-25 good quality posts and contact us and About Us section. Receiving Google Adsense Approval without them can prove to be a tough one. In addition to Google Adsense, you can earn good money through Affiliate Marketing. For this, joining a good affiliate program, you can find their Affiliate Links Place Place Commission in your blog. For more information on Affiliate Marketing, here is Affiliate Marketing and how to earn money from affiliate marketing. There are many companies nowadays who continue to contact Famous Blogger for writing Paid reviews of their products. When your blog is also Famous, you can earn money by writing Paid reviews of a specific product or service of a company.